I am very happy to see that Benjamin Tissoires work to enable the Dell Canvas and Totem has started to land in the upstream kernel. This work is the result of a collaboration between ourselves at Red Hat and Dell to bring this exciting device to Linux users. 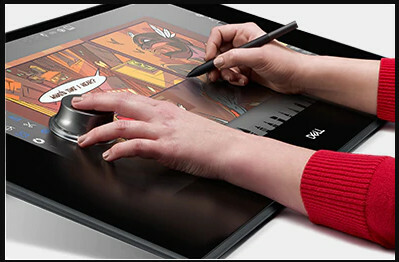 The Dell Canvas and totem is essentially a graphics tablet with a stylus and also a turnable knob that can be placed onto the graphics tablet. Dell feature some videos on their site showcasing the Dell Canvas being used in ares such as drawing, video editing and CAD. So for Linux applications supporting graphic drawing tablets already the canvas should work once this lands, but where we hope to see applications developers step up is adding support in their application for the totem. I have been pondering how we could help make that happen as we would be happy to donate a Dell Canvas to help kickstart application support, I am just unsure about the best way to go ahead. I was considering offering one as a prize for the first application to add support for the totem, but that seems to be a chicken and egg problem by definition. If anyone got any suggestions for how to get one of these into the hands of the developer most interested and able to take advantage of it?